BELLEFONTE, Pa. -- Helped by surveillance footage, prosecutors painted a harrowing picture of the events inside a Penn State University fraternity in early February that led them to charge 18 members in the death of a pledge. The video from cameras inside Beta Theta Pi, interviews with students and text messages allowed them to build a detailed timeline of what happened to Timothy Piazza - from his arrival for pledge acceptance night to his frat brothers' decision to call an ambulance for him the next morning. The 19-year-old from Lebanon, New Jersey, drank a life-threatening amount of alcohol during a hazing ritual and then fell numerous times, a grand jury found. Fraternity members didn't call 911 until nearly 12 hours after his first fall, when Piazza was unconscious, the panel concluded. 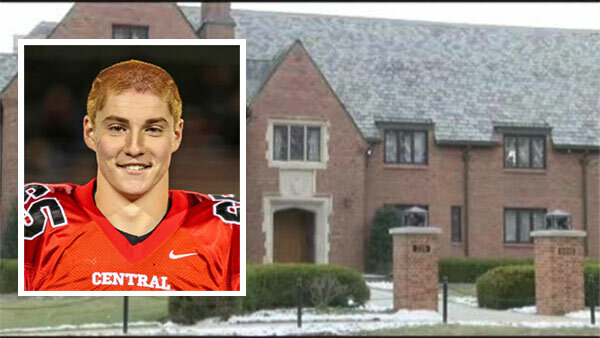 Eight fraternity brothers are accused of involuntary manslaughter. The others face charges ranging from furnishing alcohol to minors to evidence tampering. No pleas have yet been entered. The following is a timeline of the events as described in the grand jury report. Times have been adjusted to account for the fraternity's camera system being 37 minutes behind the actual time. Penn State frat 911 call: 'We have a friend who's unconscious.' Annie McCormick reports during Action News at 11 p.m. on May 8, 2017. About 9 p.m.: Fourteen pledges arrive at Beta Theta Pi for pledge acceptance ceremony. Pledges are led to basement and directed to drink from a vodka bottle. They run a gauntlet of drinking stations, downing vodka, chugging beer and drinking from a wine bottle. They also play beer pong. By one estimate, they each consume four to five drinks in about 2 minutes. 11:24 p.m.: Piazza is carried upstairs by four fraternity members. His body appears limp and his eyes are closed. A bruise appears on his left abdomen. He's placed on the couch with others around him. A member appears to administer a sternum rub, but Piazza does not respond. 11:26 p.m.: Someone dumps liquid on Piazza's face, but he does not respond. Another fraternity brother lifts Piazza's arm, which appears limp. More liquid is poured on his face. A brother removes his shoes and tries to turn him on his side, causing Piazza to nearly fall off the couch. 11:32 p.m.: A brother attaches a backpack to Piazza so he won't roll onto his back and choke on his own vomit. 11:37 p.m.: A brother sits at Piazza's legs to prevent him from rolling over. 11:51 p.m.: A brother is shown on tape examining Piazza and making animated gestures. He later tells the grand jury he saw a bruise on Piazza's chest and that he was thrashing and making weird movements. He stressed Piazza needed medical care, but another member shoved him into a wall and told him to leave. The brother confronts the chapter's vice president, who also dismisses his concerns. 11:53 p.m.: A fraternity member sends a group message: "Piazza might actually be a problem. He fell 14 feet down a flight of stairs, hair-first, going to need help." 12:02 a.m.: The fraternity's pledge master slaps Piazza three times in the face. 1:37 a.m.: Piazza vomits. Three brothers again attach a backpack to Piazza's back in an effort to keep him from rolling onto his back. 2:25 a.m.: Piazza rolls off the couch, onto the floor. Three brothers "slammed him onto the couch," grand jury says. Minutes later a brother, seemingly frustrated, strikes Piazza in the abdomen with his open right hand. Penn State frat brother: Pleas to call 911 were dismissed. ABC News reports on May 7, 2017. 4:23 a.m.: Piazza is on the floor in the fetal position. He's on his knees and continues to grab his abdomen. Several minutes later he again tries to stand but falls facedown onto the wood floor. 6:03 a.m.: Another brother comes downstairs for water, walks Piazza into the house's "great hall." Piazza falls down three steps and the brother leaves him on the floor. 10 a.m.: Two members see Piazza's shoes and realize he must be in the house, so they search for him and find him behind a bar in the basement. He is on his back with his arms tight against his sides, breathing heavily with blood on his face. He feels cold to the touch and his eyes remain half-open. Three members carry him back upstairs and put him on the couch. Over the next 42 minutes members shake him, try to prop up his limp body, cover him with a blanket, wipe his face and try to dress him. 10:35 a.m.: A brother searches on his cellphone for "falling asleep after head injury," ''cold extremities in drunk person" and related queries. 5:09 p.m.: The fraternity's president directs a member to get rid of any evidence of alcohol.